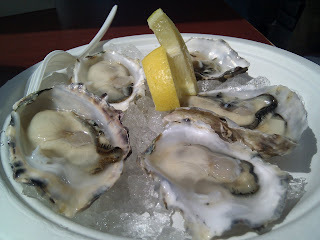 Hungry Kat: Oysters for Breakfast! I've been suffering very bad neck pain for the past 10 days but my date with Rob (Rob's oysters to be specific) helped transport me to a painless and delicious world this morning. The oysters were fresh, buttery and plump and they're at a price that can't be beat! They're $2 each shucked so you can enjoy it onsite or $10 a dozen for you to take home and shuck it yourself. These babies are so fresh you can eat it plain or with just a squirt of lemon. The buttery goodness of the sea is still lingering in my mouth. Mmmm. Carlsbad Aquafarms is at the Santa Monica Wednesday Farmers Market (8am to 1:30pm) and also the Hollywood Sunday Farmers Market (8am to 1pm). You'd be hard-pressed to find such delicious oysters anywhere else in this town for such a great price. They carry a variety of oysters (Luna, Blondes, etc. ), clams, mussels and even red ogo. So, what are you waiting for? If you love oysters, treat yourself and head to Santa Monica now!